It started with a dream of avoiding the stalemate of the Great War. A generation of idealistic young men thought that glory awaited among the clouds, and strategic bombing, it was theorized, was the solution to attritional warfare. But when was returned and 1000s of aircraft darkened the skies, ideals were overwhelmed by the need to defeat the evil of the Nazis. Bombs Away! 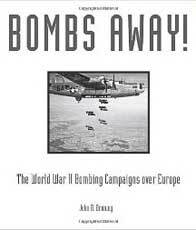 covers strategic aerial bombardment in Europe between 1939 and 1945 including the American (U.S. Army Air Forces) and British (RAF Bomber Command) aerial campaigns against Germany, as well as the German use of strategic bombing during the conquest of Europe and the Battle of Britain. The fighters and bombers and the men who flew and maintained them are featured in 100s of rare photographs, dozens of them in color, while the text follows the pilots and their commanders through the evolving air war from its primitive beginnings in World War I to the massive long-range campaigns that helped end the war in Europe.